The FBI has stepped in to assist local law enforcement in the search for a North Carolina woman who vanished this week while taking a work break from her job at Starbucks. Allison Cope never returned from a scheduled break during her shift at the Starbucks inside Raleigh-Durham International Airport on Monday at 3 p.m. ET. She was reported missing to airport police that night. Investigators believe Cope left the airport parking lot in her silver Ford Fusion, which had a North Carolina license plate and a "Change of Heart Pit Bull Rescue" sticker on the rear window. About an hour later, at approximately 4:15 p.m., surveillance cameras captured Cope at a Shell gas station in Wake Forest, some 25 miles away from the airport, according to the Raleigh-Durham Airport Authority Police Department, which is leading the search. 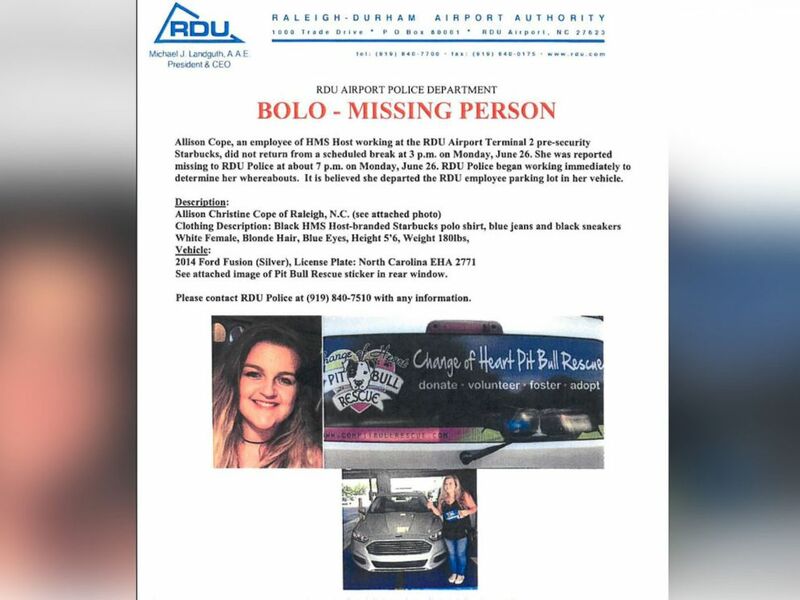 "Airport police have thoroughly reviewed the video and there is no evidence that she is under any distress," Raleigh-Durham Airport Authority Police Department said in a press release today, while releasing the surveillance images showing Cope. So far, airport police have uncovered no evidence of any crimes being committed at the airport or anywhere on the airport campus. 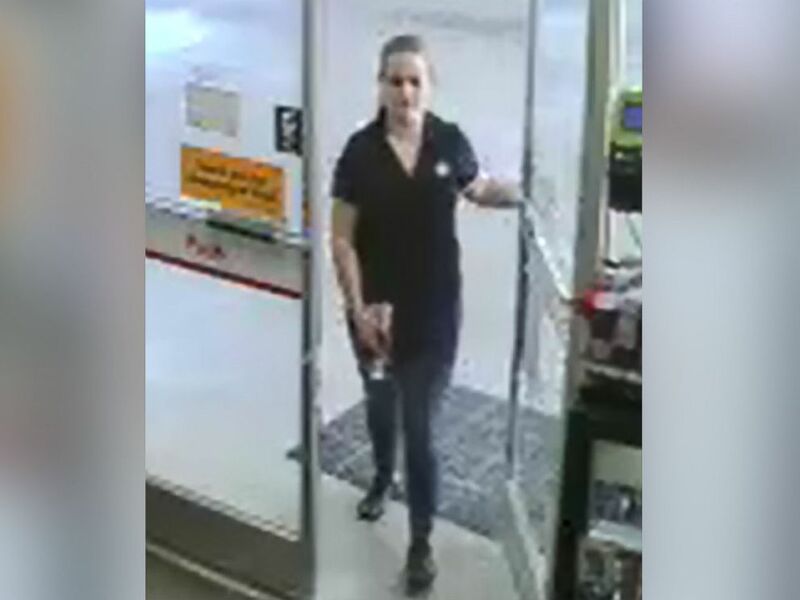 Surveillance cameras captured Allison Cope at a Shell gas station in Wake Forest, N.C., at approximately 4:15 p.m. ET on June 26, 2017. FBI spokeswoman Shelley Lynch confirmed to ABC News today that the agency is now assisting police in the investigation. "The FBI is assisting our local law enforcement partners with the RDU airport police. It is standard practice for the FBI to assist state and local law enforcement partners when we may have an technique or tool that could be useful in their investigation," Lynch said in a statement. "Any additional questions should be directed to RDU." Cope's family has not returned ABC News' request for comment. Cope's roommate and longtime friend, Sarah Kosinski, told ABC News she believes Cope went to her car during her work break because Kosinski had texted her earlier that day asking whether she had left her car registration paperwork inside Cope’s vehicle. The two friends did wedding photography together and were scheduled to work at a July 13 wedding. They also had planned to take a trip together, Kosinski said. “Allison would never just disappear without telling anyone,” she told ABC News in an emotional interview. Allison Cope, an employee at the Starbucks inside Raleigh-Durham International Airport, never returned from her scheduled work break on June 26, 2017. Kosinski, who is the founder of Change of Heart Pit Bull Rescue, wrote on the animal nonprofit's Facebook page today, pleading for the public's help in locating her friend. She said Cope has volunteered at the Change of Heart Pit Bull Rescue for several years and reiterated that she "would never just disappear." "I know her better than the back of my hand," Kosinski wrote in the Facebook post. "I know she would not leave the dogs ... My gut knows this." Justin Ferrell, another close friend of Cope's who lives with her and Kosinksi, told ABC Durham station WTVD-TV he's only known Cope for a year but considers her to be family. "It's been the best year of my life knowing her," Ferrell told the station. "She's been there for me when no one else has been there for me." Investigators describe Cope as a white woman in her mid-20s with blond hair, blue eyes and standing 5 feet 6 inches tall. She was last seen wearing a black Starbucks polo shirt, blue jeans and black sneakers. Anyone with information on Cope's whereabouts can contact the Raleigh-Durham Airport Authority Police Department at (919) 840-7510.